The purpose of the EOQ model is simple, to find that particular quantity to order which minimizes the total variable costs of inventory. Back orders are common in inventories held for resale to customers. The EOQ model can be modified to handle back orders by including one more cost, the cost per unit back ordered. Use the modified EOQ model for production lot sizes to ensure that the EOQ is larger than maximum investment to account for sales made during the production run. When demand is uncertain, inventory investment from the EOQ model should be supplemented with safety stock. 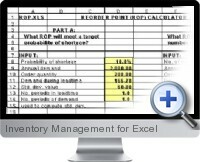 The Reorder points and safety stocks (ROP) template can be used to compute safety stocks and reorder points.